Written by Noah, a member of ENO Baylis Youth Company and a Year 10 student at Westminster City School. 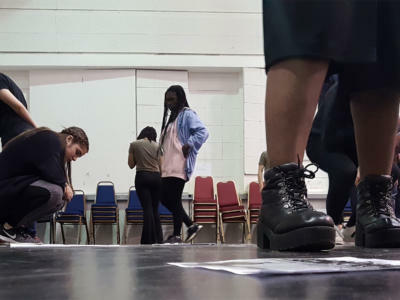 Read Noah’s thoughts his experience of the Youth Company so far and on their third module which responded to ENO’s Production of Philip Glass’s opera Satyagraha. 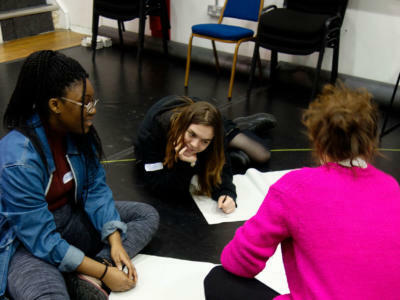 Working with director Caroline Williams, composer Pete Letanka and designer Rhiannon Newman, the group explored the themes in the opera of non-violent protest, equality and how to effect change, using these as a springboard to create their own text, music and design work. They also met with ENO Head Milliner Megan Bearup to explore mask making for performance. ‘My name is Noah and I enjoyed my half term week at the ENO youth company. The reason why I enjoy taking part in the company is because although I studied some classical music, Opera was a genre of music I was not exposed to until the ENO did a workshop at my school, which made me curious. In the last two half terms I have appreciated creating music and acting out different scenes such as King Midas’s atonement, from our previous module. On our day we discussed as a group why we all decided to take part in the project. We were then introduced to our artistic team. Firstly, we were able to work with Caroline Williams who is a theatre director with a particular interest in current political issues. Interestingly enough, Caroline has worked regularly with the director Phelim McDermott who directed ENO’s production of Satyagraha (the production we were studying). Secondly, Rhiannon Newman Brown, who is a freelance designer, producer and art director working in opera and theatre. Lastly, Pete Letanka, who is a professional jazz pianist and composer who has led projects for the Royal Opera House and the London Philharmonic Orchestra. Firstly, we played a game to find out how we could change the world for the better. This was an insightful activity as we realised it takes a lot of effort to make a difference. As a group we looked at different protest marches across England; for instance, Black Lives Matters march, Women’s march, and the Grenfell Tower. Then in pairs we talked about which issues we felt need to be changed in the world. We came up with numerous ideas, for example: gentrification, women’s rights, minority power, and mental health. We also met ENO Head Milliner Megan Bearup who has created many masks for different Opera performances. We then split off into twos and started to create our own masks that represented the issues we had highlighted. It was great to find out about the creative journey of designing masks. During the process half of us went away and did some composition work for a Satyagraha theme song. When they came back, as a group we sang the music they had created, which I really enjoyed. Before the end of the day we were set a task of coming up with a quote/slogan for a placard, on the topic we chose. appreciated being able to watch it because I won’t forget it. 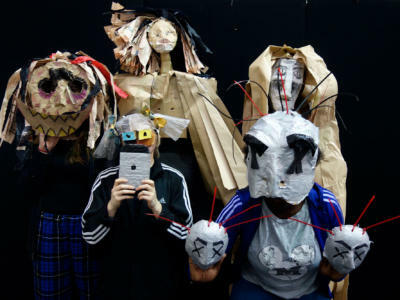 I really enjoyed day 5 of the Youth company, as I was able to present my ideas for change and design a mask – it’s not every day you get the chance to do something creative and political. Also, to be a part of a creative process was really exciting and I believe it had a positive impact on me. I have found that being part of the Youth Company has really influenced me in many ways. I really enjoy all the creative exercises we do: such as our discussions, the things we make, sharing our ideas and especially working with exciting people. In terms of when I play music in church, I believe I am more confident in trying out different styles and rhythms. Also, at school, I think I have more confidence in using my imagination and sharing my ideas.